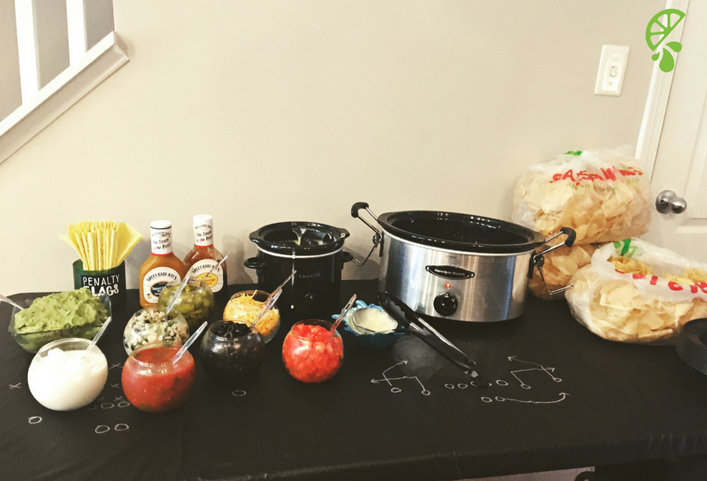 Football is back and while we are patiently awaiting the cooler weather, the time has never been better to throw a football themed tailgate party! 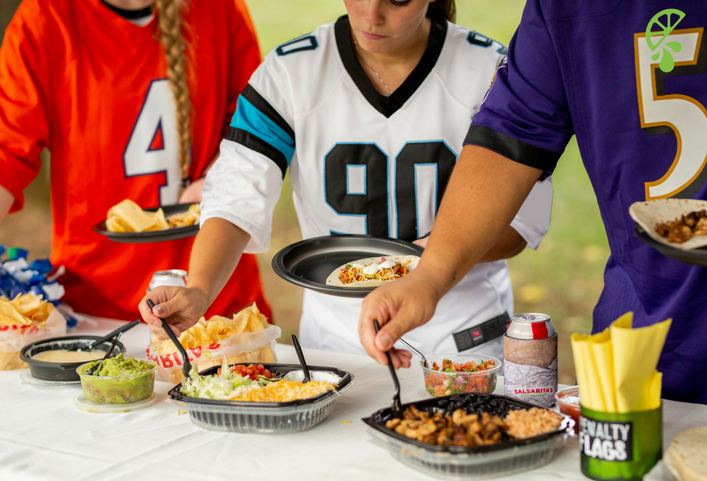 Whether you’re in the lot outside of the stadium or in the comfort of your living room, take these great party ideas and put your team’s twist on them! 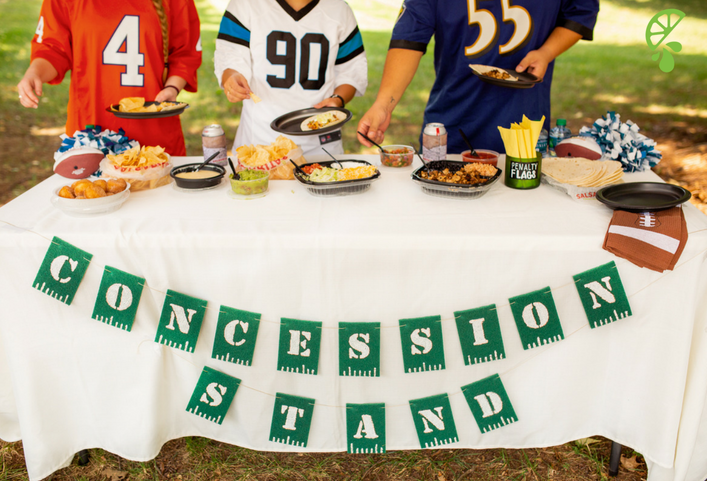 Adding your football theme in unexpected places is a sure way to make sure you have a memorable tailgate party. Use solid yellow napkins and decorate an old candle holder or jar with “Penalty Flags” for a fun way to hold an otherwise boring paper product. Pick up a few green dish pads from the local dollar store and use them to make a fun sign for your table or walls! Use white acrylic paint and stencils for a clean finish. What makes going to a football game miserable? Going hungry. Fortunately, we’ve got you covered on this one. 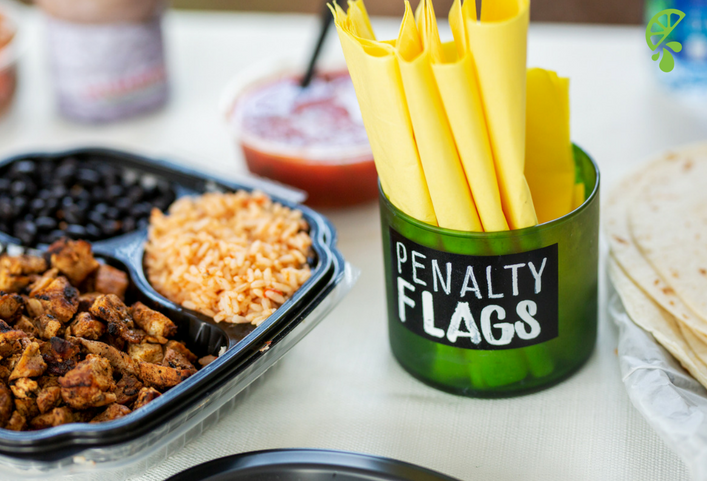 Depending on your party size, choose from a fiesta pack (pictured below as a Deluxe Fiesta Pack) or order catering so that everyone at the party gets what they’re after. Buy your fiesta pack here! With all of those Salsarita’s chips, make it easier for your friends and family to grab a good amount in the cleanest way possible. Pre-made bags using white duct tape are the perfect tailgate accessory! Our hot salsa and our mild salsa are equally delicious but not equal in terms of heat. Let your party goers know the difference with these FREE printable football labels. For those who prefer maximum compliments with minimal effort, create football play chart tablecloth! A solid black tablecloth or fabric will do and your choice of white or silver permanent marker is all you need. You can reference Google or a reliable friend to come up with the plays or just make them up and shrug your shoulders later.